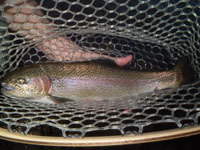 Ready to go? 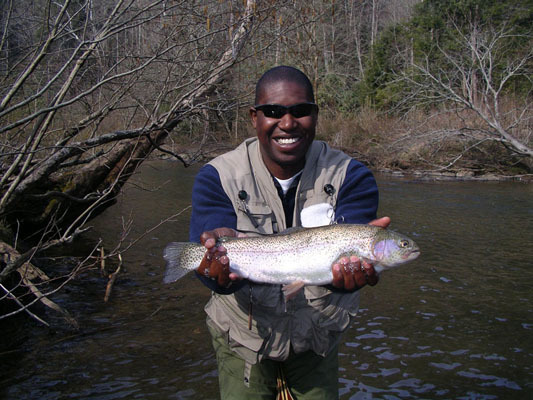 Click here to check our schedule! 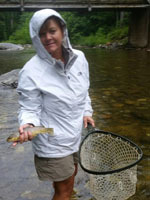 Katy McBride with one of the West Fork's brownies on July 2, 2015 (clicketty bigger). 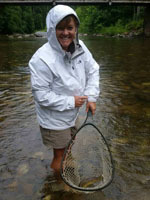 Katy McBride and her sister Suzie teamed up for some pre-Fourth of July fireworks on the West Fork of the Pigeon River, guided by Altamont Anglers' Travis Brotherton. 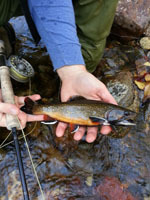 The Delayed Harvest season on the West Fork ended over a month ago, which is one way of saying that the harvesting of trout has been on for over a month. 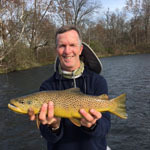 It's a testament to the skills of the guide when he takes novice fly fishers to such an environment, and they still catch fish! 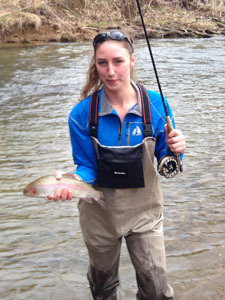 Katy had this to say: "We had a great time. 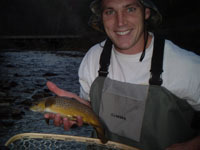 Travis is a riot. 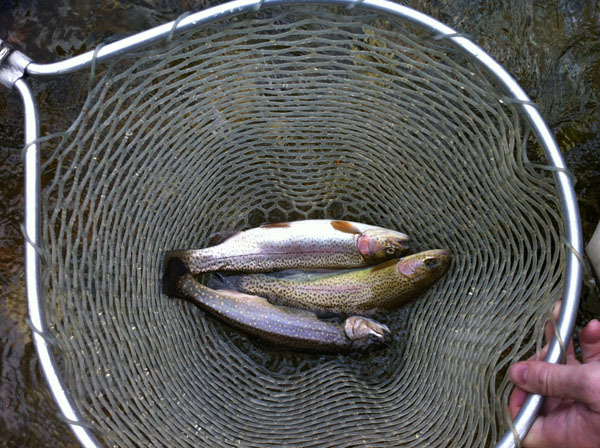 We left a few fish for the next crowd. 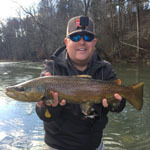 Hope I get to come back in the fall." 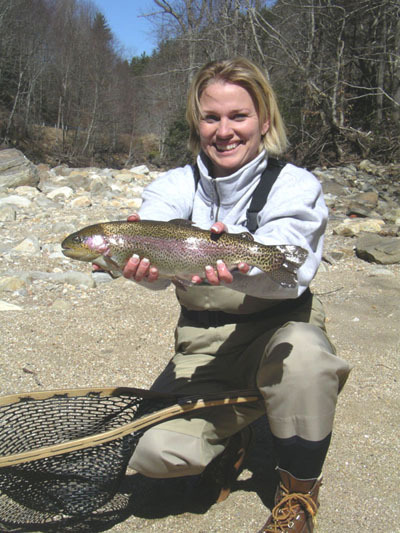 Diane Iris with a chunky Laurel River rainbow trout caught on March 10, 2015 (clicketty bigger). 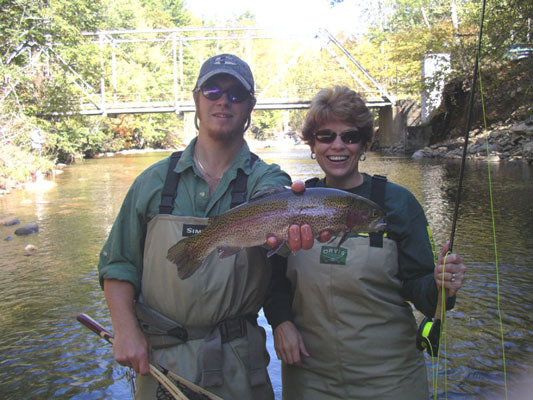 Diane Iris and her friend Ace celebrated his birthday on March 10, 2015 with a half-day of fly fishing instruction. 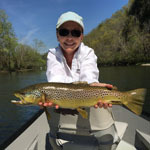 Arranged on short notice with Altamont Anglers guide Forrest Marshall, the couple ventured bravely into the Big Laurel River in Madison county and proved to be fast learners, as the photos prove. 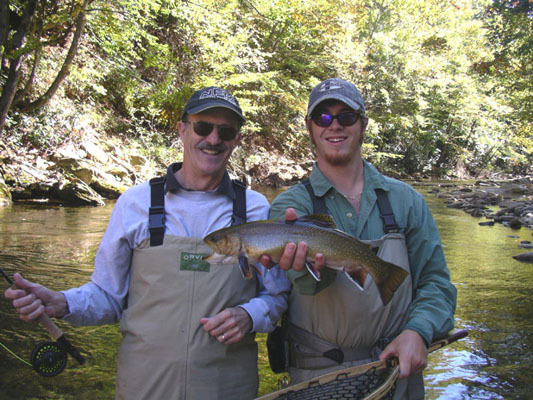 For someone who never before touched a fly rod to succeed in such short time is a tribute to both the instructor and his students, and we commend everybody (and the cooperative trout themselves) for the successful outing! 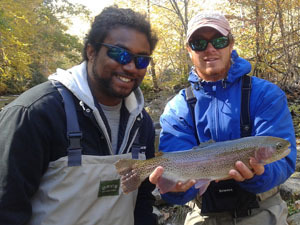 Logan Lawson caught that hefty Delayed Harvest rainbow trout held by his guide, Teo Whitlock, on October 25, 2014. 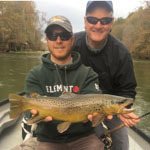 Randy Lawson re-connected with Altamont Anglers for some father-son fall fishing over the weekend of October 25-26, looking to spend some time wading and a day floating to introduce his son Logan to the mysteries of fly fishing. 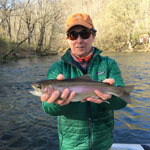 Altamont Anglers guide Teo Whitlock took Randy and Logan over to the West Fork of the Pigeon River to test the Delayed Harvest waters for Logan's initiation to the "quiet sport", where it appears from the pictures that he was a fast learner. 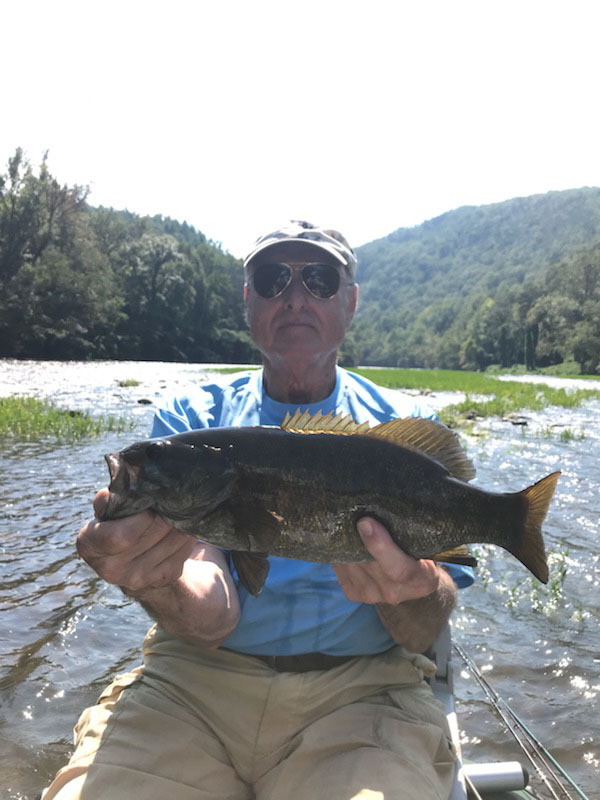 They motored over the mountain on day two for a float down the Watauga River, which has been the "hot spot" all summer and so far into the fall season. 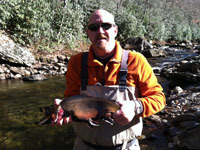 Randy had this to say about the two days: "Teo was GREAT as usual. 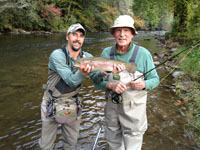 He worked closely with Logan, who'd never held a fly rod before. 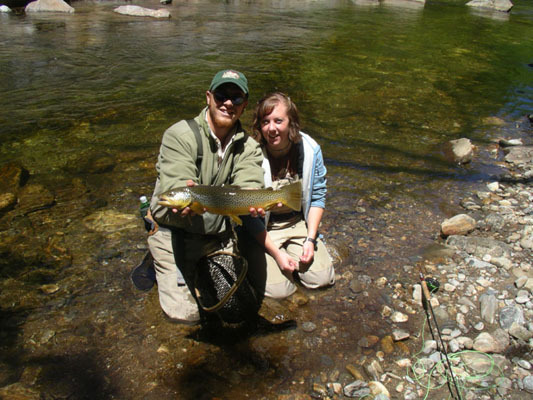 Logan had dozens of "hook ups" on Day One. 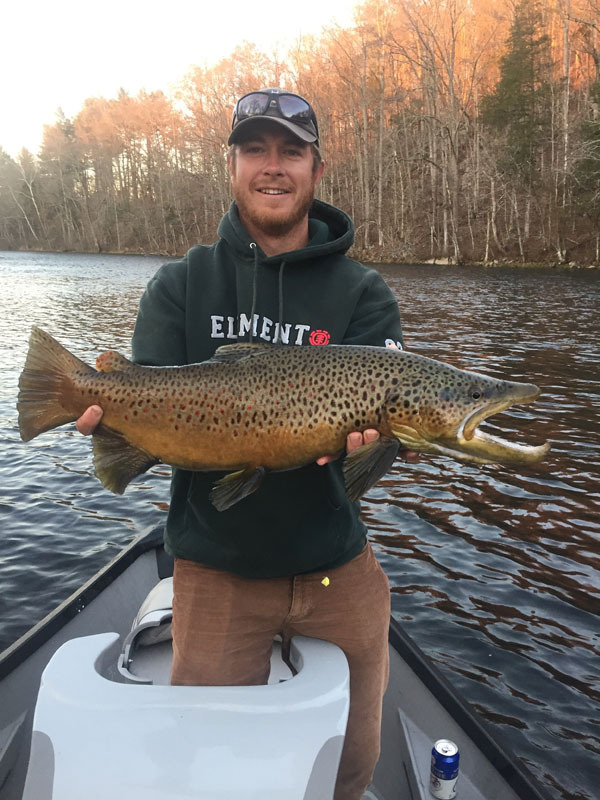 He probably landed 12-20 fish. 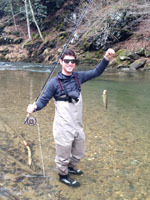 On Day Two Logan was "on fish" all day. 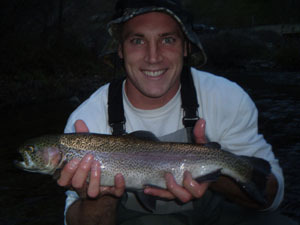 He put 20 rainbows and browns in the net. 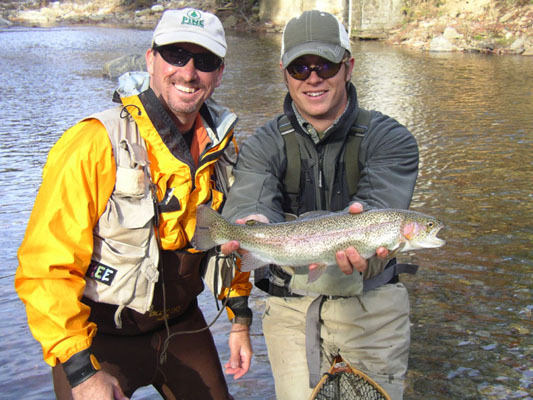 Teo gave him some time trying dry flies as well. 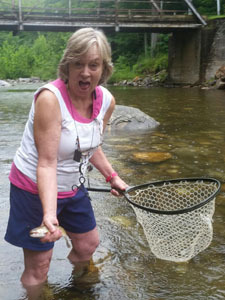 I caught my share of fish as well. 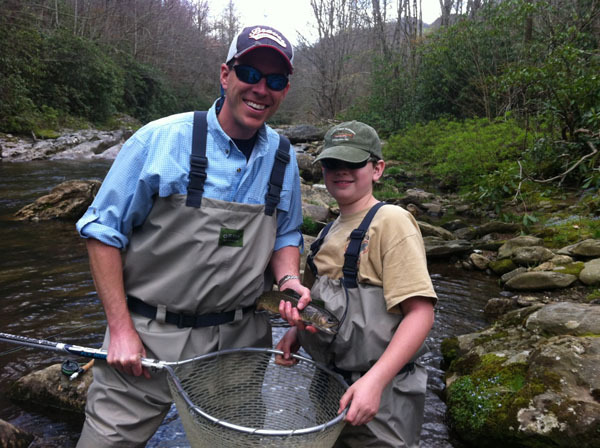 This was a father son bonding trip. 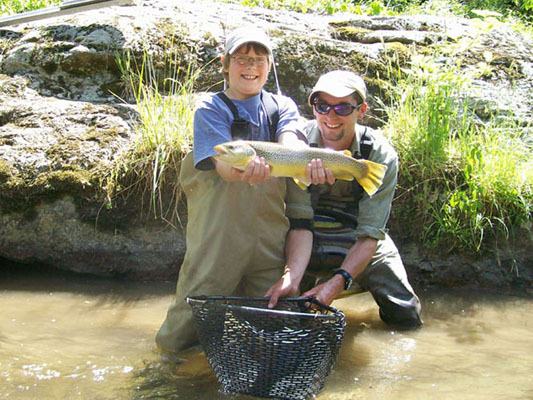 Teo made it a memory of a lifetime for both of us." 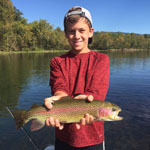 Logan Lawson on October 25, 2014. 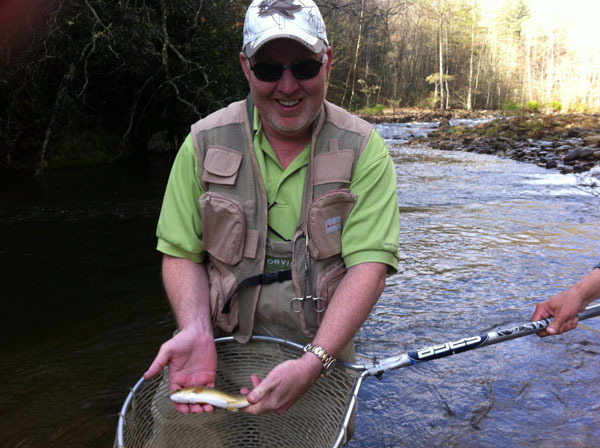 Randy Lawson on October 26, 2014. 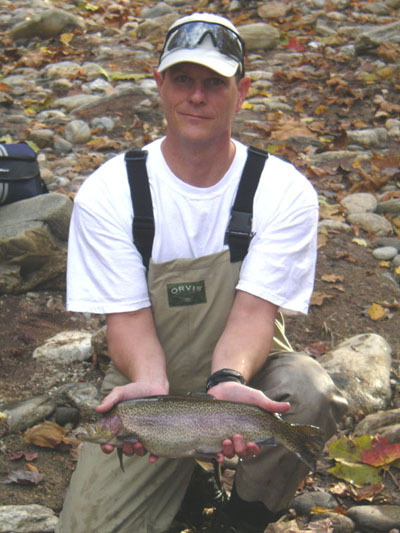 Chris Gemes with a hefty Delayed Harvest rainbow trout caught on November 14, 2013. 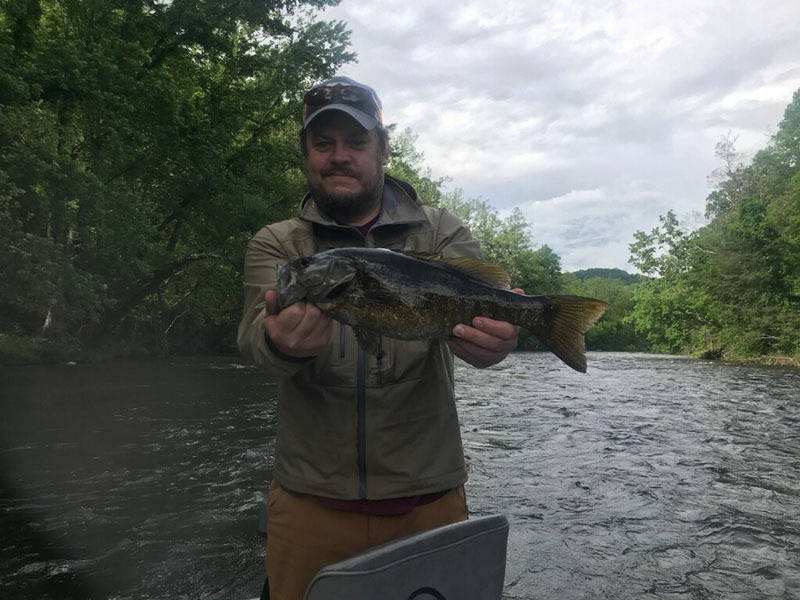 Chris fished with us this summer, floating for smallmouth bass with Joe, and enjoyed it enough to book a return trip with him to sample our Winter fishjing. 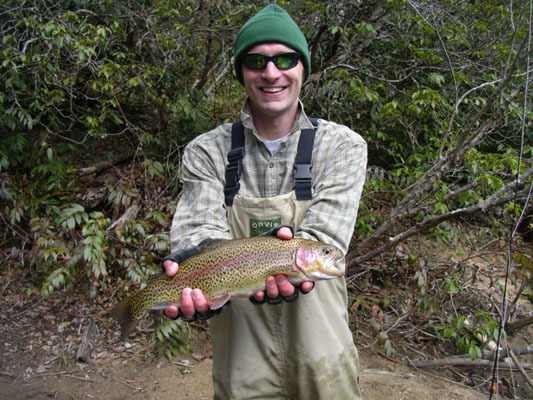 Brett with a hefty Delayed Harvest rainbow caught on November 9, 2013. 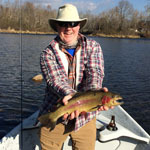 Bruce Schwenneker booked a half-day of guided fishing for himself and three others for November 9, 2013, and Altamont Anglers guides Stephen Morris and Joe Spencer showed them the delights of the North Mills River. 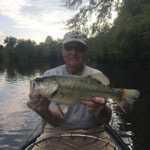 The leaves in the background of that picture of Brett and his hog are interesting: compare the background of the photos below, taken three weeks earlier to see how far Fall has progressed in that short time. 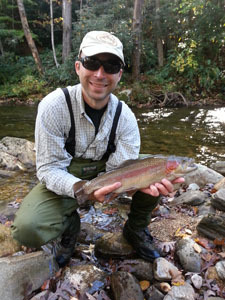 Fortunately, recent rains have flushed much of the accumulation of leaves away. 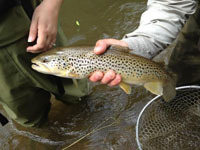 Standard attractor patterns trailed by most standard nymph patterns--Pheasant Tails, Midges, Caddis Pupae etc. 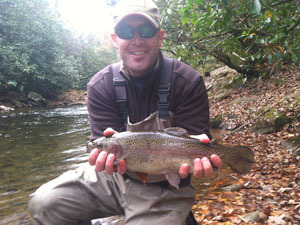 will usually do the trick on these Delayed Harvest Waters. 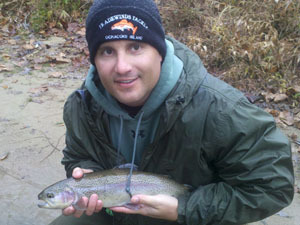 Aaron Childers with a hefty Delayed Harvest rainbow caught on October 18, 2013. 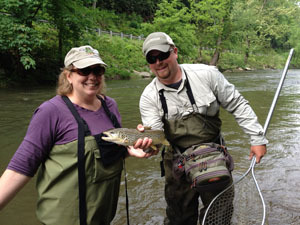 Aaron Childers' wife, Betsy, booked him a birthday gift we'd all like to get: some guided fly fishing! 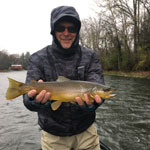 Early days in the Delayed Harvest Season, and the fish aren't too well trained by the catch-and-release practices yet, but give them a few more releases and they'll be wiser and harder to fool. 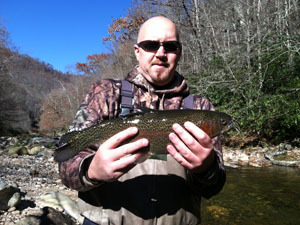 Altamont Anglers guide Teo Whitlock took Aaron and his friend to the West Fork Pigeon River for the birthday outing, and used the tried and true dry-and-a-dropper technique to put them into some big 'bows and at least one beautiful brookie. 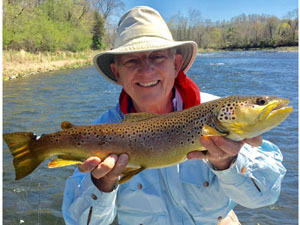 Ann Perko caught this nice brown trout, netted here by her guide, Jake Chiles on May 19, 2013 (click to enlarge). 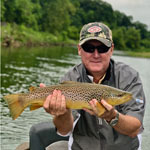 Only one more week of good fishing to be had on our Delayed Harvest streams, with the trout population on those waters being turned over to the general bait-fishing community on the first Saturday in June. 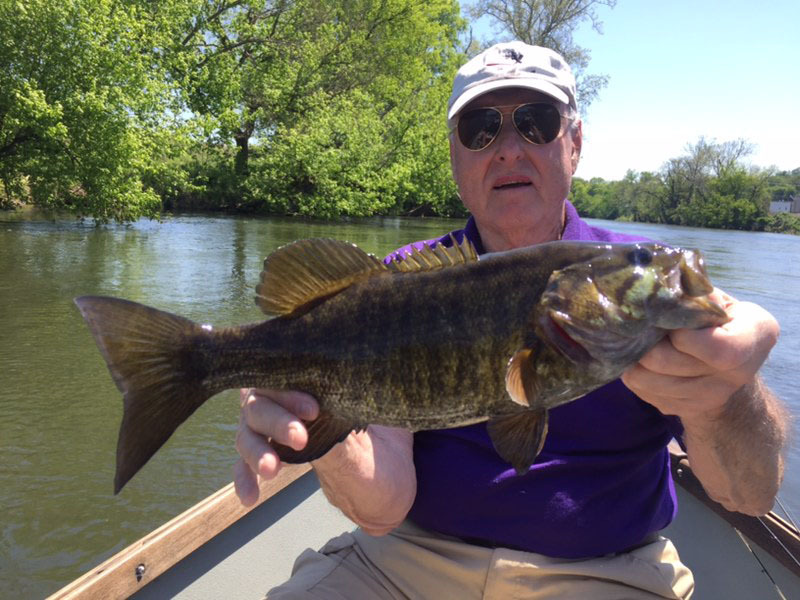 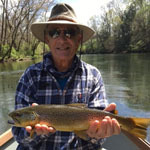 Altamont Angers' guide Jake Chiles took advantage of the Delayed Harvest beat on the Laurel River on Sunday, May 19, taking his clients Ann and Gary Perko for a half-day wade trip. 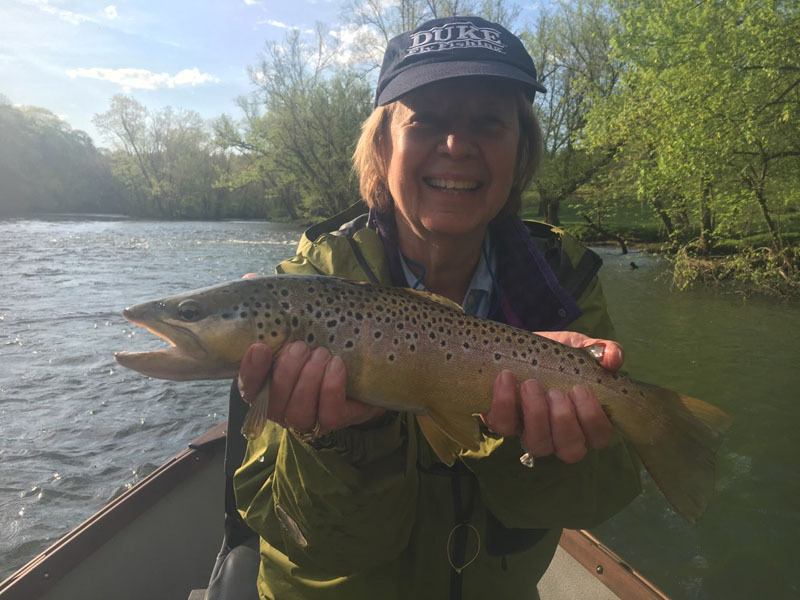 Looks like Ann had the hot hand on Sunday, judging by that nice brown trout, the best of many caught during the four hour excursion. 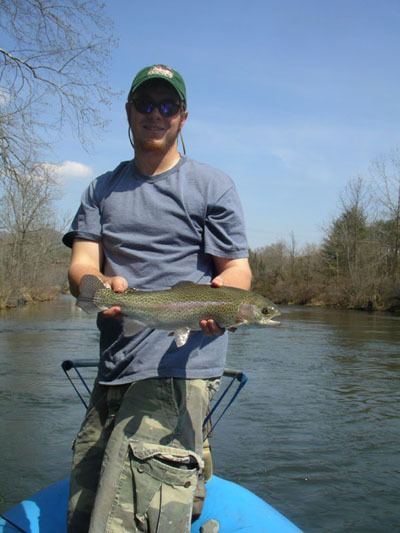 "Just wanted to say thanks to Jake for a great 1/2 day trip on the Laurel on 5/19/13. 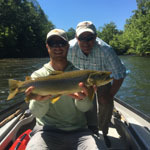 He is a true pro and gave us a trip to remember!" 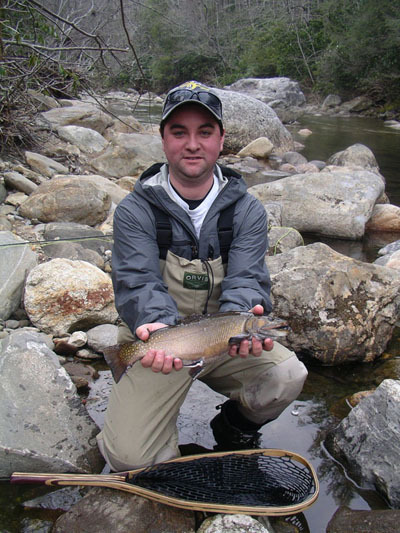 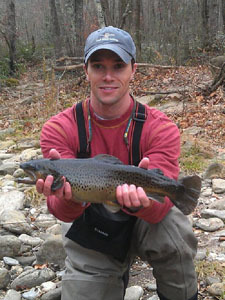 Allen Sawyer with big brown trout caught on November 4, 2012 (click to enlarge). 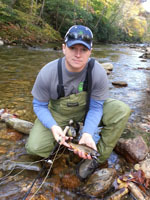 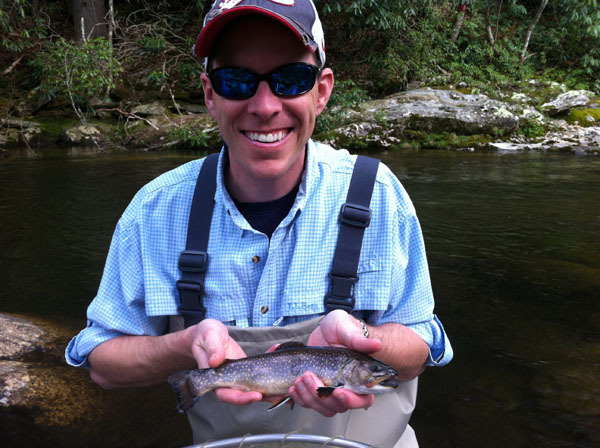 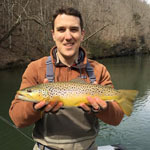 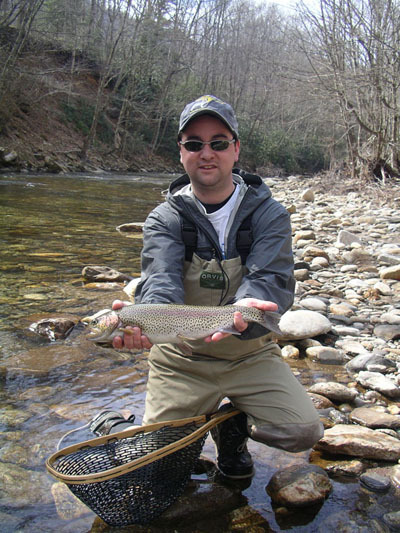 Allen Sawyer visits the Asheville area regularly, usually booking some fly fishing time with Altamont Anglers guide Teo Whitlock when he does. 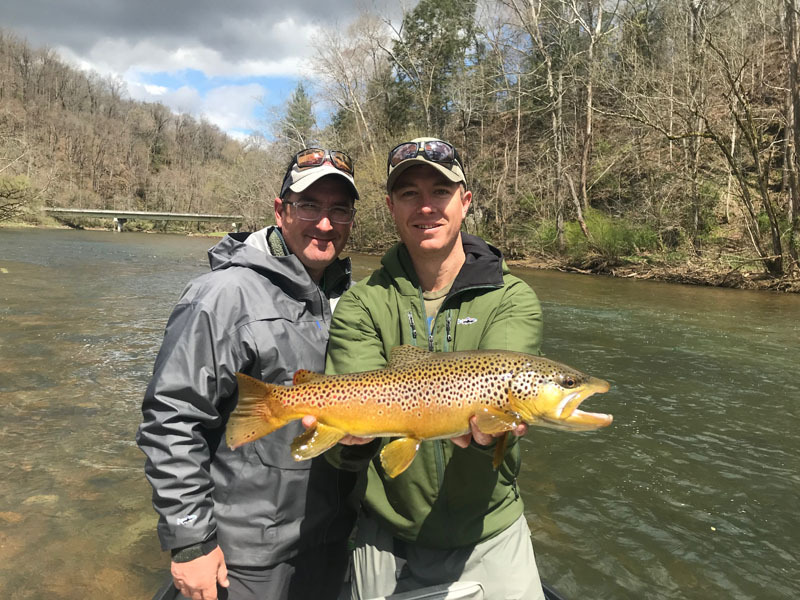 On his most recent visit we hooked him up with AA guide Jake Chiles who took Allen and a friend over to sample the Delayed Harvest offerings of the West Fork of the Pigeon River. 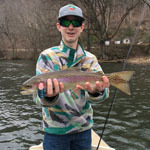 According to Allen, Jake put them into a lot of fish over the course of the day, moving about some but focusing on three specific stretches of the river (whick we will not identify here). 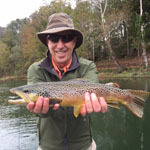 The specifics of fly selection shall remain Jake's secret, but you can expect to do well with a tandem of nymphs using an attractor such as a bead-head stonefly or rubber-leg pattern with a smaller dropper--think Zebra Midge or PT Nymph--18" below. 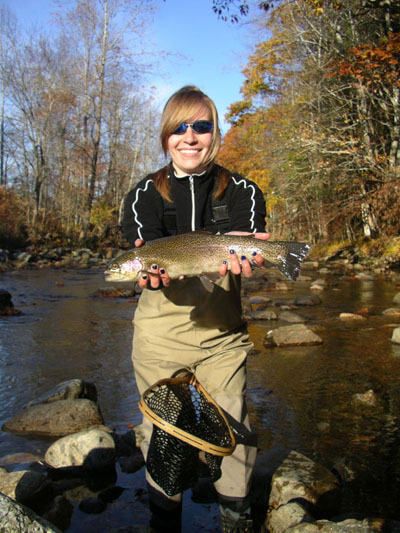 Go early or late to avoid the crowds, and enjoy the fine Fall fishing on our Delayed Harvest streams! 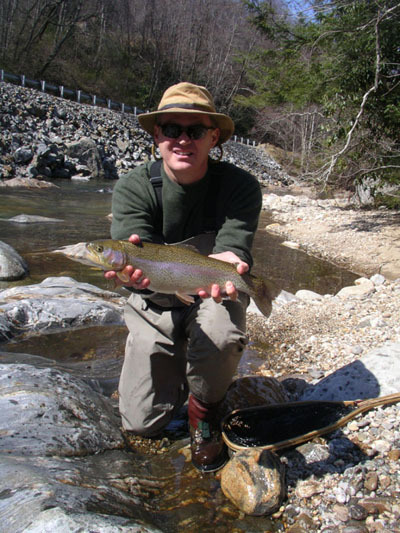 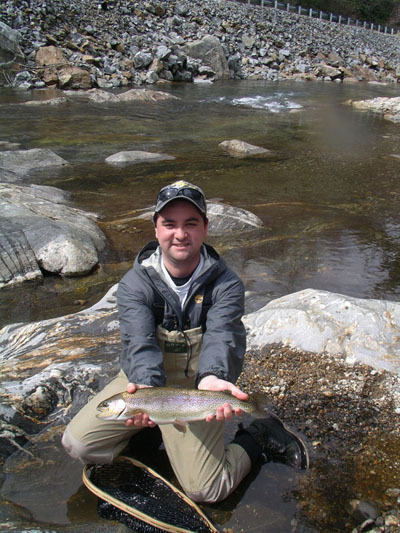 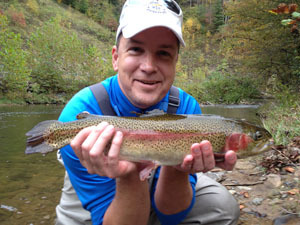 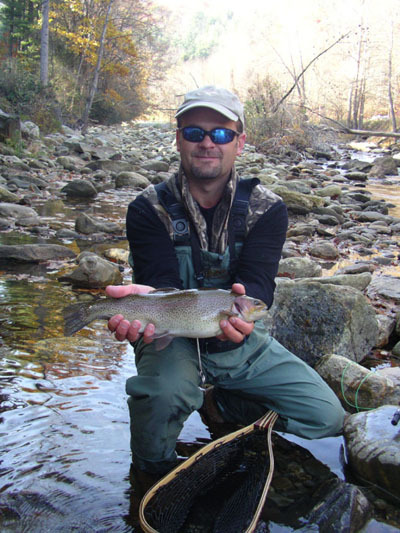 Dave DeTenley with fat Laurel River rainbow caught on October 6, 2012 (click to enlarge). 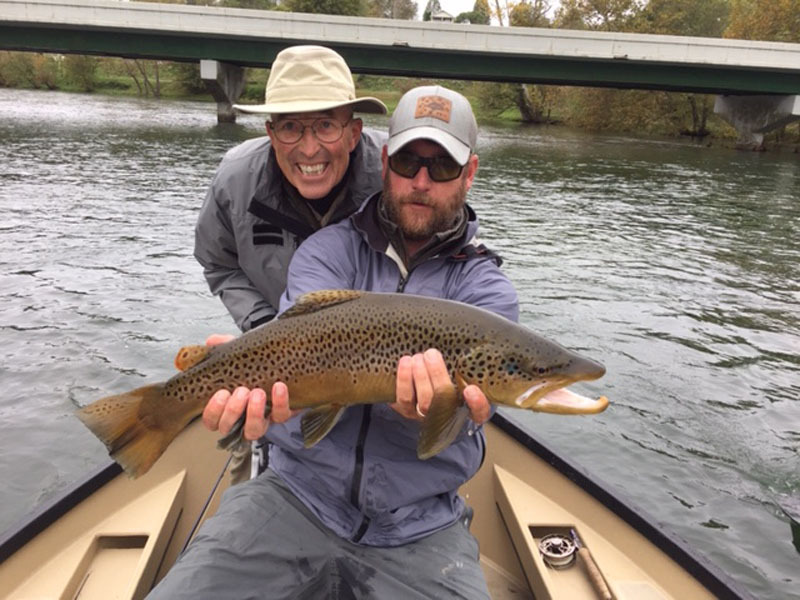 Last year Dave DeTenley had such a good time on the water with Altamont Anglers guide Jason VanDyke that he brought his dad, Don, along for a return visit last weekend. 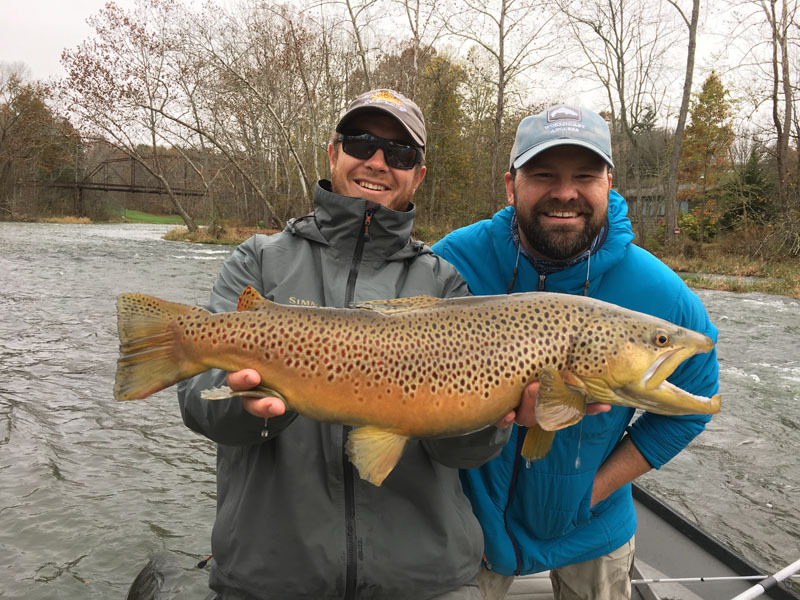 Jason took Dave and Don back to the Laurel River for a reprise of last year's adventure, and the Laurel did what it does best during Delayed Harvest season (especially the first weekiend after the season opens)--it produced trout! 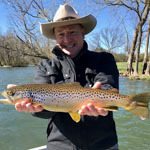 To Jason's embarrasment, his "demo" cast at the start of the day produced the first fish of the day, but the moment was soon errased from memory by a succession of eager trout brought to the net. 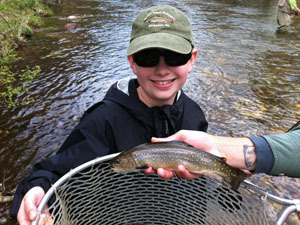 11 year-old Patrick Roberts caught this nice brook trout on the West Fork Pigeon River on March 30, 2012 (click to enlarge). 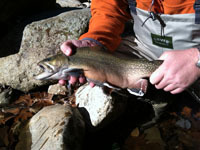 Delayed Harvest waters are packing some nice trout this Spring, and the beautiful weather makes for fun times! 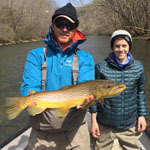 Mark Roberts and his son Patrick made the most of the situation on Saturday, March 30 with some fly fishing instruction provided by Altamont Anglers guide Jason Van Dyke. 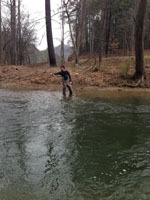 Jason targeted the West Fork of the Pigeon River for the day's lessons, and it looks like the students learned their lessons well, judging by the pictures Mark sent us. 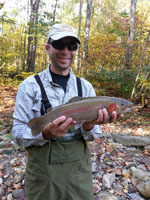 Todd Koenig caught this fine Laurel River rainbow trout right at dusk on Saturday, November 13, 2010 (click to enlarge). 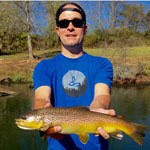 Altamont Anglers' guide Jason VanDyke seems to have started a campaign to convert "conventional tackle" anglers into fly fishers: He's recently been seen on the Laurel River, on numerous occasions, introducing avid saltwater & bass enthusiasts to the joys of the flyrod, much to the terror of the Laurel River's trout population. 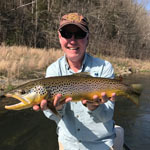 On his most recent foray, Jason was pressed into action by Jennifer Yoger when she purchased a half-day of fly fishing instruction for her boyfriend, Todd. 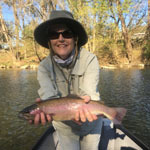 Jennifer expressed some uncertainty about Todd's interest in fly fishing, but we can tell by the gleam in his eyes in the photo to the left that the trout isn't the only thing in the picture that is "hooked". 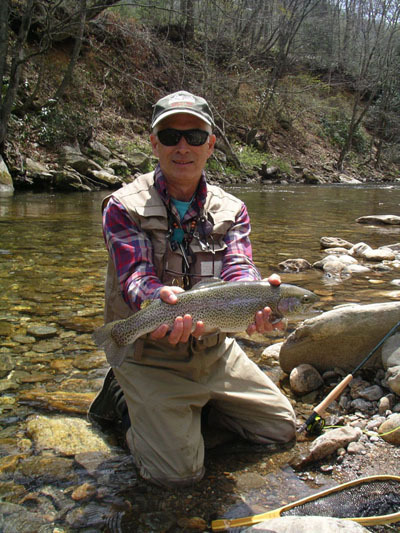 Hap Clayton hoists a fat rainbow on the Laurel River (click image to enlarge). 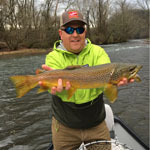 Altamont Anglers guide Jason VanDyke manned up for a short-notice booking recently, and took avid salt-water and lake fisherman Hap Clayton on Hap's first ever outing with a fly rod. 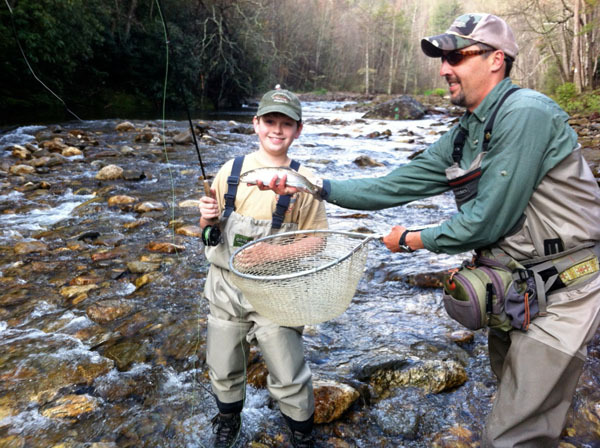 Jason chose, as his classroom for Hap's fly fishing lesson, the Laurel River. 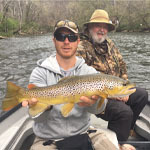 The Laurel is managed for Delayed Harvest, meaning it gets a heavy dose of larger trout once a month during the DH season, which makes it a good choice for a first-time fly fishing experience. 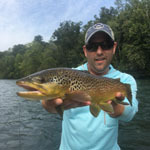 "Hey Drake, Had a great time today Jason was absolutely fantastic. 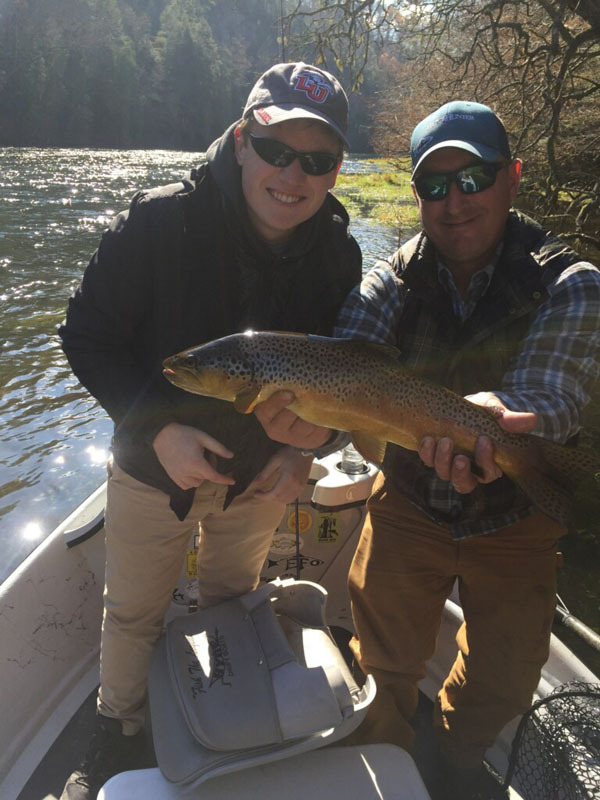 I don't believe I could've had a better guide. 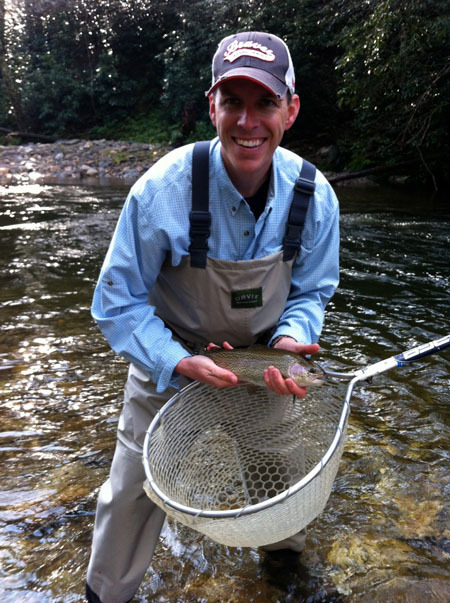 I appreciate everything feel free to use the picture."